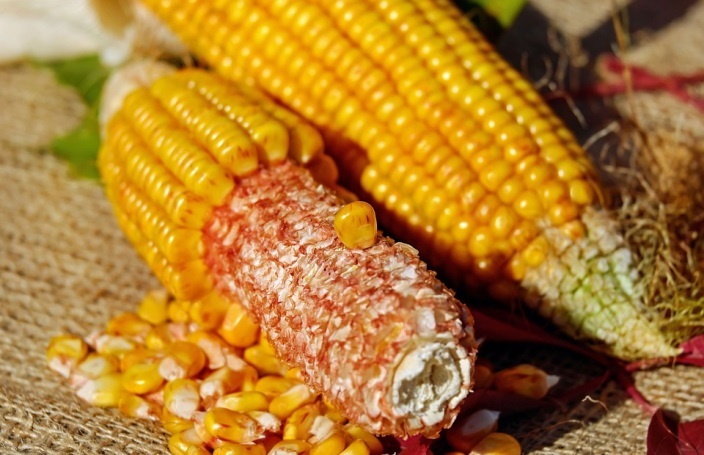 Home > Recent > Corn and Corn Products: Are They Healthy? Everybody loves a good ear of corn. The happy, yellow kernels make an appearance wrapped in tin for barbecues, alongside meaty mains and nestled into Spanish-inspired meals. Even the pickiest kid won't say no to a buttery bowl of popcorn. But, how healthy is corn really? Organic varieties of corn do have some nutritional value, containing a good amount of B vitamins and aiding in the formation of vitamin A through beta carotene. Corn provides a store of minerals (magnesium and manganese) and is rich in antioxidants (ferulic acid), especially when cooked. Ferulic acid is effective at fighting tumors and cancer-causing free radicals. Like all raw foods it is a great source of fibre, and the phytochemicals in corn – lutein and zeaxanthin – promote healthy vision. The high carbohydrate content of corn increases blood sugar levels, guarding against anaemia, though this is bad news for diabetics who should consume corn sparingly. Eating whole-grain corn products like tortillas and popcorn can aid the digestive system because it helps the body regulate foods that have been eaten. It has a high level of satiety, making you feel fuller for longer. People suffering from haemorrhoids or colorectal cancer are told to incorporate corn into their diet. It reduces the risk of both health issues. The high level of fibre stimulates the movement of bile and stool, easing the chance of constipation in those with irritable bowel syndrome. Air-popped popcorn topped with sea salt can be a great, low-calorie snack. 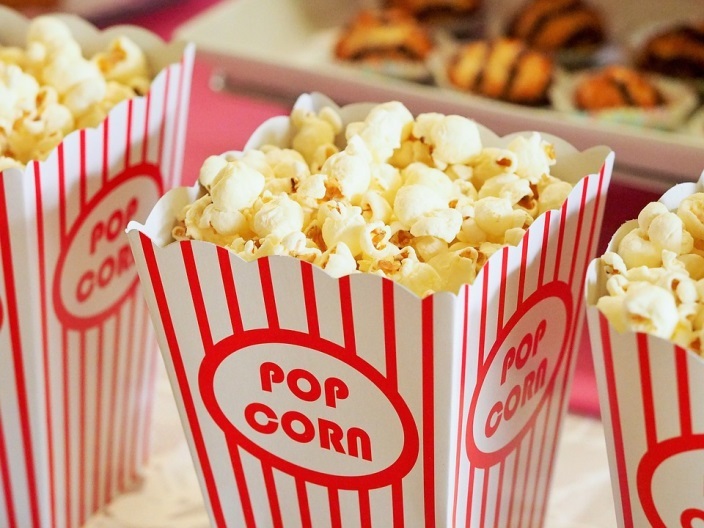 One cup of air-popped popcorn contains approximately 30 calories. Popcorn popped in two tablespoons of oil will have an extra 250 calories, still not a bad calorie count when compared to processed chips or crisps in the grocery store. Make sure you’re choosing whole-grain kernels to reap all the benefits. Loading up popcorn with sugar, salt and butter does significantly lessen the goodness of this snack. Microwave popcorn, however, presents a whole host of problems. The bags used for this kind of popcorn are coated in all sorts of unpleasant toxins, like perfluorooctanoic acid (PFOA) which is classified as a carcinogen. Diacetyl is the chemical used to give microwave popcorn that nice, buttery taste. 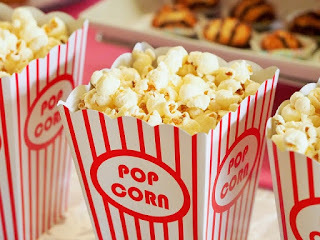 The Environmental Working Group (EWG) has disclosed that diacetyl “has caused serious and sometimes fatal lung disease in workers in flavouring and popcorn factories.” If you are going to indulge in popcorn, make sure you prepare it on the stove top or with an air popper. That being said, corn isn’t as healthy as people would like to believe. Consumption leads to bloating, flatulence, indigestion, intestinal irritation/diarrhoea and can increase weight if relied on too heavily. Corn is high in carbohydrates and contains an indigestible type of protein called prolamin. Lectin is another type of protein found in popcorn that stimulates fat production. Modified versions, like high fructose corn syrup, can alter the chemical composition of the body, creating uncontrollable cravings for processed foods. In recent years, documentaries have come out exposing the truth about the yellow ears. Food Inc. is one such example. The documentary takes a hard look at how corn is used in the food manufacturing and meat processing industries. 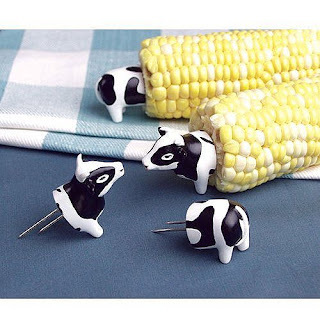 American farmers are encouraged to grow corn crop over other crops. In fact, 30% of the land base in the US is used to grow corn. The overwhelming stock of corn has produced a cheap and easy source of feed for American livestock. For many farmers, corn makes up the majority of the diets of many cows. It is easily accessible, affordable and produces beef of a certain standard. The abundance of corn has forced food scientists to create uses for it. A food scientist in the documentary estimated that 90% of processed food products in grocery stores contain corn or soybean (or both) in some form. Processed food in particular contains rearrangements of corn in the form of additives – cellulose, saccharin, polydextrose, xanthan gum, maltodextrin and high fructose corn syrup. To understand how corn affects a cow’s body, we must first understand how their digestive system works. 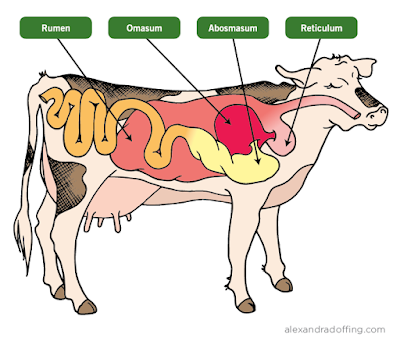 Cattles are ruminants, having a four-part compartmentalised stomach. A special digestive process takes place to aid in the digestion of rough feed: grass, legumes and hay. At first, a cow chews just enough to get the feed down. Once swallowed the food goes to the first and second stomachs, the rumen and reticulum, for storage while the cow eats its fill. The largely unchewed food is later coughed up to be completely chewed up before being swallowed. Then chewed food, cud, goes directly to the third and fourth stomachs, the omasum and abosmasum, to be fully digested. Cows are meant to eat feeds high in fibre and low in digestibility of nutrients. The North Dakota State University classifies over half of the protein in corn as “escape” protein. Rather than follow a cow’s natural digestive process, the escape protein bypasses fermentation by microorganisms in the cow’s first stomach and is absorbed by the small intestine. The remaining protein follows the regular process. 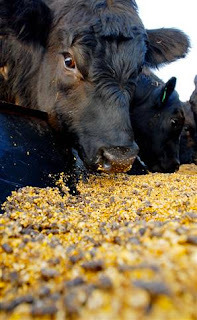 For beef cattle, farmers will often include forages in the diet, a supplemental feed comprised of different components. Industry practice often sees cattle subsisting on forages from a young age. The problem here is that farmers use forages that oppose the cow’s needs, choosing instead to use feed high in digestible energy and low in fibre. These are called concentrates, often made of “cereal grains (corn, wheat, oats, barley, sorghum) and by-products of milling or processing these grains (soybean meal, cottonseed meal, peanut meal), or by-products of ethanol or alcohol production (distillers grains).” A diet mainly made up of concentrates will produce very large cows as these feeds encourage rapid growth and weight gain. Cows would not eat anything resembling concentrates in nature. Cows who subsist on a mostly-corn diet are more likely to experience health issues. The most common problems to arise are bloating, kidney stones, fatal amounts of gas and liver abscesses. To combat the kidney stones, cows raised for slaughter are given calcium supplements. These problems can be somewhat offset by including hay or grass in the corn-based diet. Unfortunately, farmers of other animal proteins are following this practice, forcing fish and chickens to consume corn-based diets. Grass-fed beef is more expensive for a reason. There is an obvious difference in taste and texture between grass-fed and corn-fed beef. In corn-fed beef, the empty calories in their feed translate into a higher fat content, marbling the meat with fat. By comparison, grass-fed beef is leaner and contains far fewer calories. It may not be quite as sumptuous without the extra fat, but it is by far the healthier option.